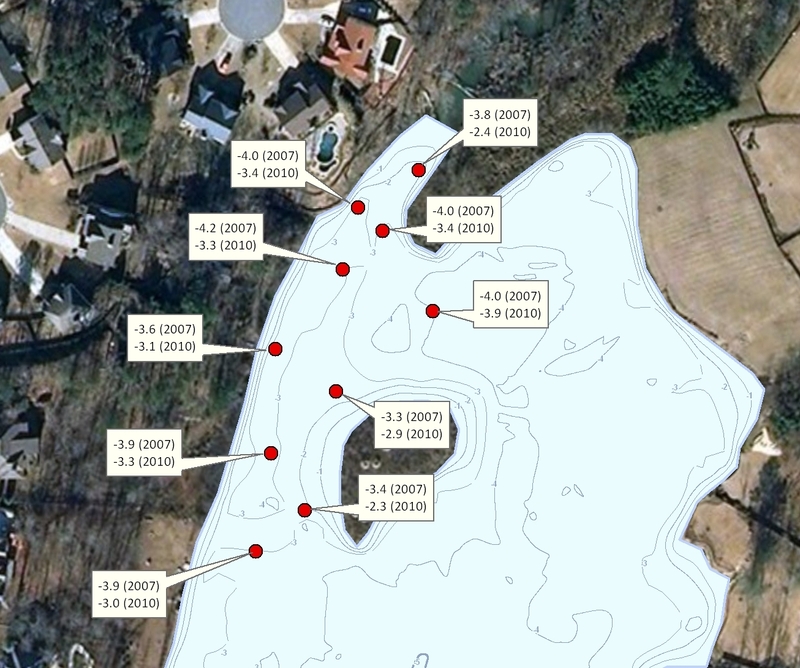 Bathymetric Lake Mapping was performed by Greg Grimes with Aquatic Environmental Services for a homeowners association in a suburb of Atlanta, Georgia. Originally mapped by Aquatic Environmental Services in 2007, the HOA wanted to create an updated base map of lake depths and locate areas of sediment accumulation due to heavy construction upstream. Comparing lake depth data from 2007 and 2010 allows the HOA to estimate how much sedimentation is occurring and aids in budgeting for future dredging costs. In the end, the HOA saves thousands of dollars and limits the impact to the ecosystem by isolating sediment problem areas to dredge instead of disturbing a large swath of the lake which is unnecessary. The dredging companies also benefit by knowing exactly what type of sedimentation deposits they are dealing with and the composition of such deposits with core sampling analysis. 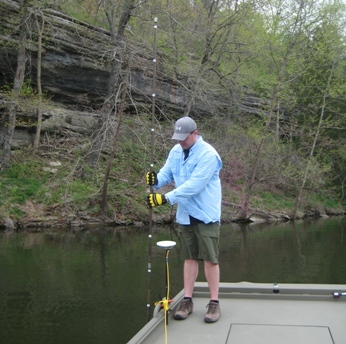 The mapping techniques utilized in this project and subsequent lake mapping results allowed Aquatic Environmental Services to devise an accurate resource management plan for the association. The finished project included a Bathymetric Lake Map with 3D Color-shaded depths and contour map with locations of high risk sediment areas. Below is a map displaying the 2010 contour lines along with random points comparing depths over a 3 year period (2007 to 2010). The map depicts exactly where the sediment is settling and how deep. 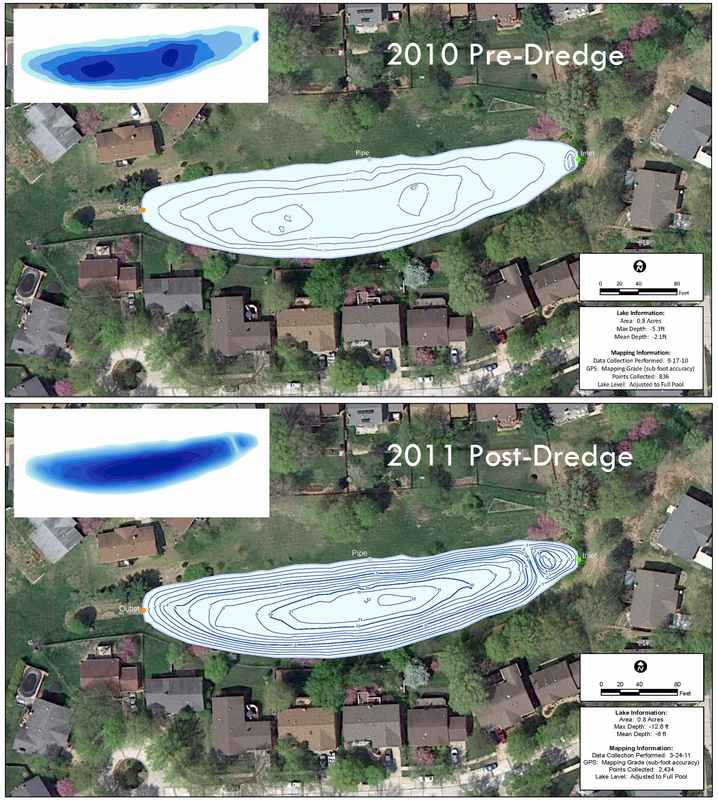 Comparison of lake depths from 2007 to 2010. 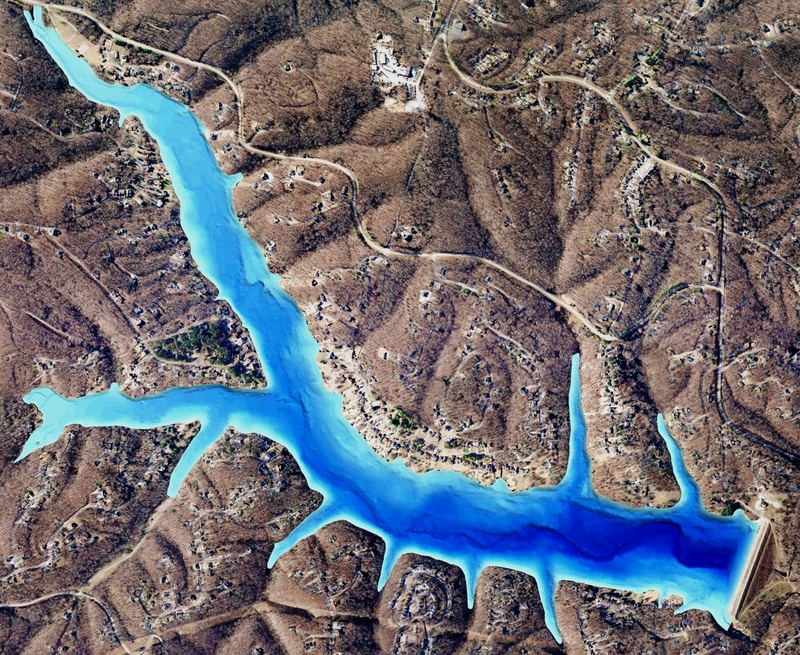 Understanding sedimentation is critical to successful lake management. This entry was posted in Lake Map and tagged Bathymetric Map, Dredging, Fishing, Georgia Bathymetry, Georgia Lake, Georgia Lake Map, GIS, GPS, GPS Lake, GPS Map, Habitat, Lake Management, Lake Map, Lake Mapping, Lake Survey, The Mapping Network, Trophy Bass, Trophy Fish, Trophy Lake on July 9, 2010 by Moderator.